If you enjoy playing Fantasy Football, then participating in Daily Fantasy Sports leagues will likely be of interest to you as well. If you are a beginner and interested in learning more about daily fantasy, the following site explains all the rules and basics of daily fantasy sports. Cameron Wake served owners with another goose egg. Although this situation is extremely frustrating, it's important to recognize that Wake only played 16 snaps in Week 2. The coaching staff opted to rest him in the second half as he's still recovering from a hamstring injury he suffered in Week 1. He's not a drop at this point as a healthy Wake will produce, but he's best kept on benches until we get a better understanding of how the Dolphins plan to use him moving forward given the injury. Kiko Alonso and Mychal Kendricks both left Sunday's game against the Cowboys and did not return. Alonso likely re-aggravated an injury to his knee. Initial unconfirmed reports are stating that the Eagles fear he may miss the rest of the season. Mychal Kendricks suffered a hamstring injury but no specifics on his injury severity were available as of Monday night. We should receive more news on both of their long-term playing statuses within the next couple of days. Luke Kuechly missed last week's game as he has yet to pass the NFL concussion protocol. His progress will be checked throughout the week. 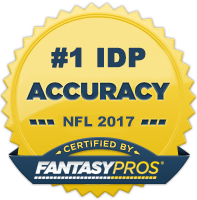 Make sure to follow me on Twitter as I often post important IDP injury updates there. Another big IDP name, DeAndre Levy, missed his 2nd straight game with a hip injury. He recently mentioned that he was "close to returning." The Lions desperately need him back as their defense has been exploited over the middle of the field in the team's first two contests. We should get a better idea of his status come Thursday. The Raiders finally got fed up with Ray Ray Armstrong's inconsistent play and inserted Curtis Lofton back into subpackages. And Lofton responded with 13 total tackles. He was likely dropped after a poor Week 1 performance and low snap count, so now would be a opportune time to go back and place a waiver request for him. Somewhat surprisingly, it was Josh Bynes in subpackages NOT Stephen Tulloch who only played in 44 of the team's 65 snaps. I'm not exactly sure why the Lions made this decision, but my gut tells me this won't be the trend moving forward. Navorro Bowman had an uncharacteristically poor IDP performance with just 4 assisted tackles on Sunday. But that stat line was more a result of the Steelers pass-heavy offensive approach than Bowman's poor play. That said, owners should not worry about Bowman moving forward (although he does face the Cardinals next week who have not been a good matchup for LBs so far this year). For those watching the Cowboys vs. Eagles game, it was evident that Sean Lee is back. He was all over the field racking up 14 total tackles. Playing weak side linebacker in Rod Marinelli's scheme has given him the freedom to roam and avoid blockers. Injuries to Tony Romo and Dez Bryant will likely result in Dallas' D being on the field more which should translate to big production for Lee. He's got a real shot at top 5 production if he stays healthy. Ryan Shazier was electric on Sunday afternoon racking up an impressive 11 solos, 4 assists, 1 sack, 1 FF, and 1 FR. He's still has room to improve in terms of his consistency, but my bet is on him to lead the Steelers IDPs in fantasy points this year. DE Jacquies Smith (TB) - If you are a follower of my blog and/or subscriber to my draft guide, you know that I was pushing Smith as a DL3 value target leading up to the regular season. Well, he's had four sacks in his first two games (three last week) and looks well on pace for the 10 sacks I projected him for. He's likely gone in many 10 team leagues that roster at least DL3s, but if he's still available, grab him. This production is not a fluke. DE Jabaal Sheard (NE) - Sheard has been quietly disruptive so far this season. On the surface his 6 total tackles and 1 sack may seem underwhelming; however, he's tied for 2nd among all defensive linemen with 8 QB hurries. So the sacks will be coming. AND, he has Jacksonville on the schedule this week. I give Sheard a 70% for at least one sack in Week 3, making him a great sleeper candidate for those in deeper IDP leagues. DT Sen'Derrick Marks (JAX) - Marks led all defensive tackles with 10 sacks a year ago. He's yet to play this year as he's recovering from a torn ACL. He did get a limited practice in last week and has a shot at playing in Week 3. For those in deeper leagues, it's a good strategy to scoop him up this week if you have the bench space. He could be quite valuable down the stretch, particularly in DT-required leagues. OLB Dont'a Hightower (NE) - Hightower will likely be the top waiver wire pickup in most leagues this week, and rightfully so. He's overtaken Jerod Mayo as the linebacker next to Jamie Collins in subpackages and has posted lines of 6-2-1, 8-4-0.5 so far this season. Unless Belicheck throws a curveball at us (which he likes to do) and adjusts Hightower's playing time, he should be a solid LB2 for us moving forward. ILBs DeMeco Ryans/Jordan Hicks (PHI) - Coach Chip Kelly didn't provide any updates on the injury status of Mychal Kendricks or Kiko Alonso during his Monday morning press conference. We should hopefully know more within the next 48 hours. For those in deeper leagues, both DeMeco Ryans and Jordan Hicks make for nice speculative adds if you need to put in for waivers before the extent of the injuries are disclosed. Ryans would be the first up if either linebacker were to miss time with Hicks second. Both players would likely play every down if starting. SLB Justin Durant (ATL) - Durant's been a consistent high floor LB3 option for the majority of his career - he's just had trouble staying healthy. He took advantage of Paul Worrilow being banged up in Week 2 and registered 9 solo tackles. He faces off against his old team in the Dallas Cowboys in Week 3 which should give him the extra motivation he needs for 6-7 solos. SLB Hau'oli Kikaha (NO) - With 12 total tackles, 2 forced fumbles, and a sack through two games , Kikaha has been a standout so far on the Saints' defense. He's playing 80%+ of the snaps and will likely secure an every down role if his strong play continues. He's shaping up to be a LB4+/LB3- matchup play with a fairly high floor. SS Eric Berry (KC) - Quite amazingly, Berry was back in the starting lineup for the Chiefs in Week 2 and played every down (72 of 74 snaps). I've seen him on the waiver wire in a lot of leagues as many people weren't expecting a full return until closer to mid-season. His four solo tackles last week aren't eye-popping, so now is a great time to grab him while he's still flying under the radar. It may take a few weeks for him to kick it into full gear, but I'd still feel comfortable starting him as my 3rd DB in 10 team leagues right now. CB Adam Jones (CIN) - I was a bit skeptical of Jones' ability to repeat his Week 1 tackle production, but he once again led the team in tackles last week. He's a player with a nose for the ball and is getting a full complement of snaps for the first time in a handful of seasons. Combine his strong tackle production with his return yardage and you have a CB1 and/or DB2-/DB3+. SS Tony Jefferson (ARZ) - Jefferson didn't play as much as Tyrann Mathieu or Rashad Jefferson this week, but he was extremely active in run defense and led the team in tackles despite only playing in 75% of the team's snaps. He led the league in 2014 in terms of solo tackles frequency (solo tackles/snaps played) at 10.2%, so his production here isn't a huge surprise. There may be some week-to-week variance in his numbers due to non full-time status, but he's still a solid DB3+ in the long run. SS Corey Graham (BUF) - Graham was in my high upside DB3 tier entering the season. Unfortunately for Graham owners, he only made it one play in Week 1 before leaving with concussion-like symptoms. He was back on the field in Week 2 however and registered 9 total tackles (6 solos). If he was dropped in your league, he's definitely a player to consider if you need help filling out your DB3 spot. SS Brandon Meriweather (NYG) - I've always been bullish on Meriweather's fantasy potential and playing in the Giants' fantasy friendly back seven has only strengthened my belief. He was DB36 in my Week 2 rankings (41 spots higher than the rest of the IDP experts) and he rewarded me with a 8 total tackles and 2 pass deflections. For those looking to plug their DB3 spot with a consistent, high floor tackle option, Meriweather is a fine choice.